Should Landlords Renew Lease with Bad Tenants? Bad tenants are a bane for landlords. Here, the term Bad refers to people who are noisy, do not pay rent on time and are causing damages to the property. Tenants like that are probably not going to mend their ways and the only way out is to evict them. The good news is that you don’t need to renew the lease with bad tenants as the law allows landlords to get their property vacated at the end of the lease. In fact, when the lease has expired, the landlords don’t even need to give a reason to renters for getting them evicted. Hence, there is no need to mention it to tenants that you are not renewing lease due to their bad ways. Usually, for fixed-term lease agreements, there is no need to provide a reason for non-renewal. The tenant doesn’t need to declare the reason to not renew the lease as well (if he/she may choose so). At the end of the term of contract, none of the two parties (landlord and tenant) are legally bonded to follow the rules of lease. However, for Section 8 properties there is an exception where the local public housing authority (PHA) sets the rules about termination and renewal of the lease agreement. In such a case, contact your local PHA office to determine the terms of lease termination and if a reason for non-renewal is required or not. Moreover, inquire about cases that constitute an invalid or valid reason of not renewing the lease so that you are never accused of breaking the law. Please note that all the data and information related to the tenant must be saved in writing and the decision of non-renewal of lase must also be documented. It is a good idea to inform the tenants about your decision of not renewing the lease beforehand so that they are mentally and financially prepared to search for a new home. Also, this will be helpful in giving them enough time to find a new place so that when the time of lease expiry comes, there won’t be any extensions in deadline required and everything will be sorted out smoothly. Don’t forget to send your tenant a notice in written form and keep a copy with you so that you have evidence that you followed the law. Landlords must include notification time frame in the lease agreements as well but if yours doesn’t specify a particular time then giving the tenant at least 28 days or a full month would be reasonable enough time for finding a new place. For instance, if the lease will be expiring on December 30th, then you must notify the tenant by November 30th that the lease will not be renewed. However, you need to check the laws of your state because rules and duration of notice vary from region to region. 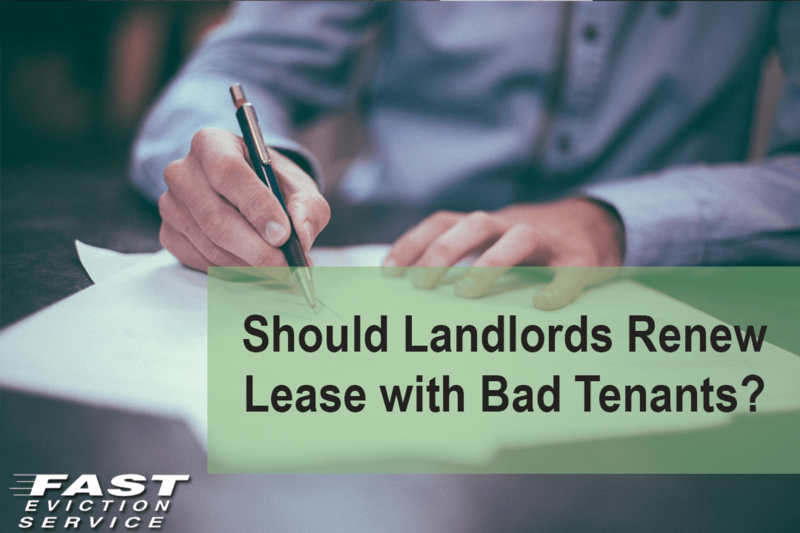 As it is already mentioned that landlords don’t necessarily need a reason to not renew the lease but having bad tenants is a strong enough reason to do so. In this regard, please remember that if you give this reason then you must have solid proof to prove your point. Such as before and after photographs or videos to show that you are being fair and reasonable. If you don’t follow proper process, your tenant may hold you responsible and even report about your practices claiming that you are discriminating. According to the law, landlords aren’t allowed to terminate or not renew a lease due to discrimination of any sort. Such as, you cannot give the reasoning that you don’t want to keep White or Black tenants or you don’t want Muslim or Jew to occupy your unit. Decision of not renewing the lease must not be made on the basis of religious, cultural or political views of the tenant and/or the race or color. If tenant files a lawsuit on the ground of discrimination, you might get into trouble. Many landlords opt for month-to-month tenancy, which means that a specific date of lease expiry is never mentioned in the contract. This is an easy way out if you feel that you might need to get the property evacuated at some point of time. However, remember that sending a notice is mandatory even if the lease a month-to-month. The eviction notice must be sent at least a month before you intend to get the rental unit vacant. Landlords must ditch a bad tenant immediately as it is beneficial for their own property. You will certainly be able to find good tenants the next time but if you let the bad tenants occupy your property for another lease term, you can expect all sorts of wear and tear and stressful situations in the future. Lease And Rental Agreement - Why The Confusion?